Here’s No. 72 Madison Brengle offering a stand-up routine during a changeover, wondering if she’s going to die after being struck by a Serena Williams serve, and trying to figure out whether her optimal return strategy against the world No. 2 is to play confusingly bad tennis. “Maybe even worse, because I think she’s surprised how bad I am,” she jokes with coach Nicole Melichar. Take it as a goofy, endearing peek into the mind of someone in the middle the upset of her career, in full disbelief that it might actually happen. 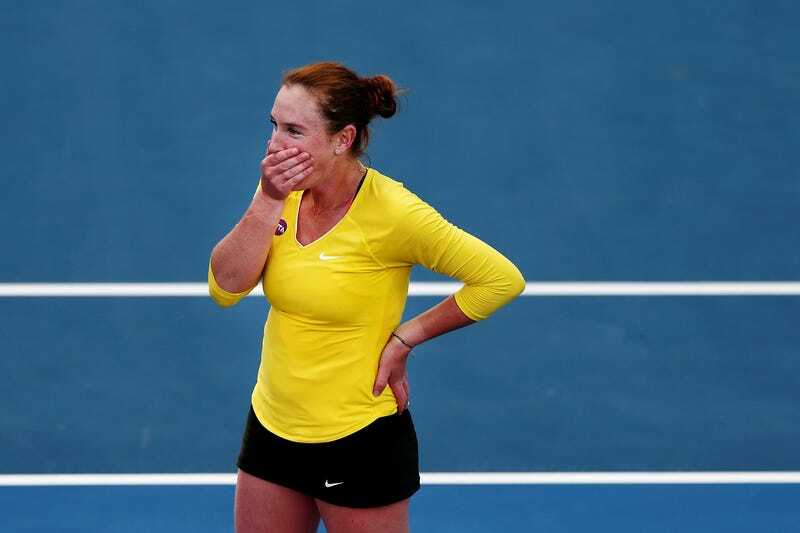 It did happen, but it’d be hard to attribute it to any particular strategy of hers: Brengle won 106 points in the match, and Williams gave up 88 unforced errors. (Take the “unforced” designation with a grain of salt, but broadly this means Serena fucked up a whole bunch, and Brengle “earned” 18 points.) Props to the WTA for some nice trollish video edit, making it seem like Serena, sitting downwind, heard the chatter and was unamused.